Riamfada love the mash. But only selective parts of the mash. Since I did have lots of mash (even at quarter quantity), I had been giving her more than she could eat. So she chose what she wanted to eat. For a balance diet, she need to eat most of that, and not just what she liked. I guess as a more seasoned caregiver, I have more steel and backbone in me that I did not have at the beginning with Tinkerbell. Instead of big portion of mash, I gave him small portion of mash. That encouraged him to eat stuff that he turned his nose up against. I guess that forced him to experiment more with other ingredients and he got to like that too. Heck! That mash is good to eat! At the beginning he did not want it at all. I noticed that whatever I eat, he wanted to eat as well. So I sat with him, a bowl of mash and a tiny spoon. I took a spoon of mash and ate it, and then offered him a spoon that he licked. Then another spoon of mash for me, and then him again. I gave him a large tablespoon of mash early in morning. I then had my coffee. Then 15 mins later, go back to his room to do some stepup and recall exercises. When I got back for lunch, his mash bowl got cleaned again, and another load of mash given. Ten mins later, exercises with him proceeded. Then when I got back from work, that same routine again. Since he ate all the mash, I gave him more mash. I checked what he left uneaten. I was pleased that was rather random this time. Which meant he basically ate all components of the mash ensuring as complete nutritional value as posible. Traditional clicker training said you get best results on empty stomach. I do not know. As you can see, I got excellent results even when Riamfada ate before the training. 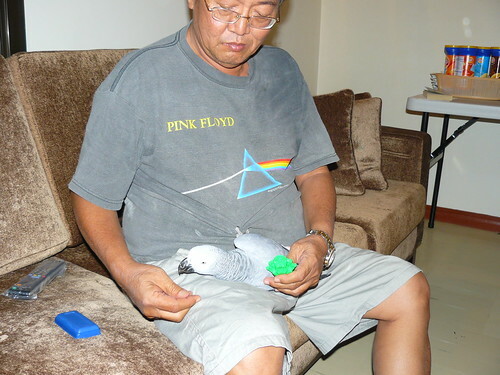 And I got very good results with Yingshiong and Tinkerbell despite their eating first prior to training with me. Clicker training is a very important pathway for a better understanding that must be the foundation of relationship. It is almost a bridge between minds. While I have trained with Riamfada, that was not precise enough. Not when I hoped to later take him with me outdoors. I will need to let him know of what I wanted, and if his response to me was correct. For that , I need to let him know via the clicker. This make a consistent sound. There are a lot more to it than what I can write here. Time spend in writing meant time away from Riamfada who is still in his room waiting for me. So on 1 Oct 08, I started on clicker training with Riamfada. The first part was conditioning of the clicker. I click, and then gave Riamfada a sunflower seed. Instead of giving the treat directly, I am giving the anticipation of the treat as well as the treat later on. I did not do usual step up and recall exercises today. More of that will come later. Instead, I walked to Riam, clicked , and treat. Again and again. At random times. So did my wife. When he was standing on the bars, I walked to him , clicked and treat. This went on from time to time from lunch through the whole day. 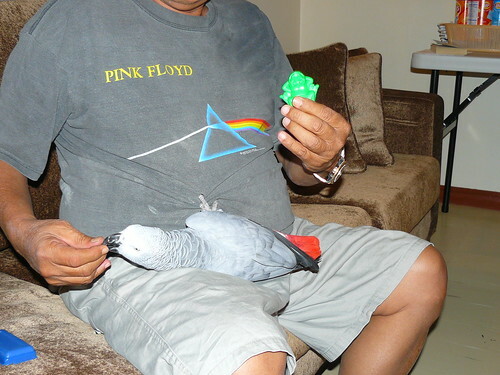 Even when he flew to me and clung on to my Tshirt for his headrubs, he got his click and treat. What a lucky, lucky bird! Glad to see he likes showers - Betsy CAG isn't crazy about them. I think she doesn't like to be surprised by the spray, because she seems to prefer going down to the bottom of the cage and splashing around by herself in a big pan of water. Last night we had a big storm with tons of rain and wind. At 9 PM when I walked into my kitchen, a common house finch was on the outside of my window, looking soaked and scared. I went out there thinking it might be a baby that was blown out of his nest - but it seemed to be an adult that was disoriented. He ended up perching on my outside ornamental tree which was in shelter from the rain, so I turned off the porch light so he would be able to sleep. Poor little buy. 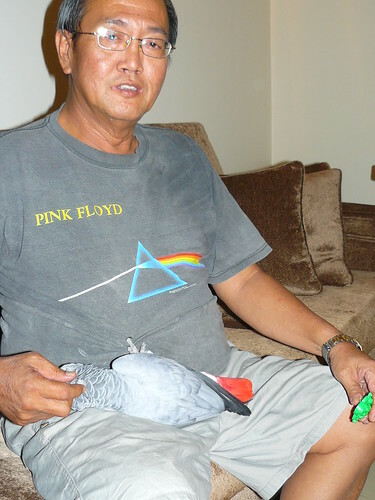 I came inside the house and told my fids how lucky they are. Riam is a beautiful CAG.